Lightning has fascinated and excited humans for as long as they have watched the skies. 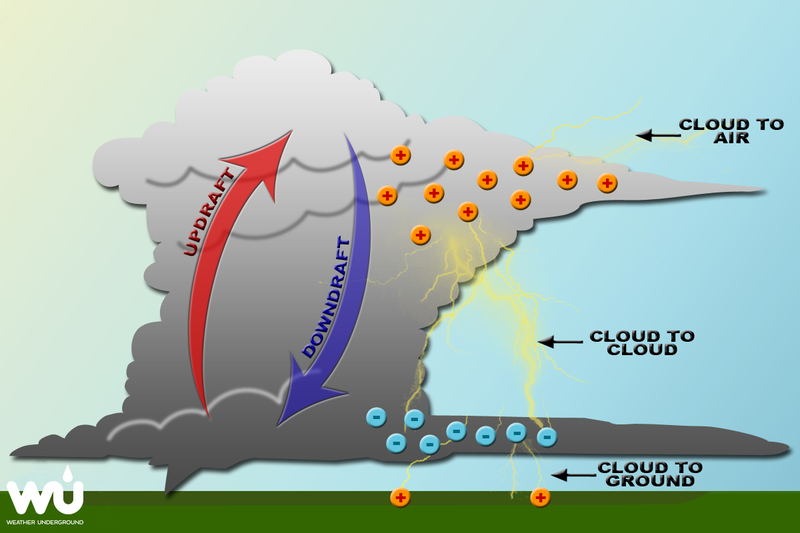 Although meteorologists understand the cloud conditions necessary to produce it, lightning cannot be forecasted. At any moment, there are as many as 1,800 thunderstorms in progress somewhere on earth and each is producing deadly lightning. Lightning detection systems in the U.S. see an average of 25 million strokes of lightning each year, from some 100,000 storms. 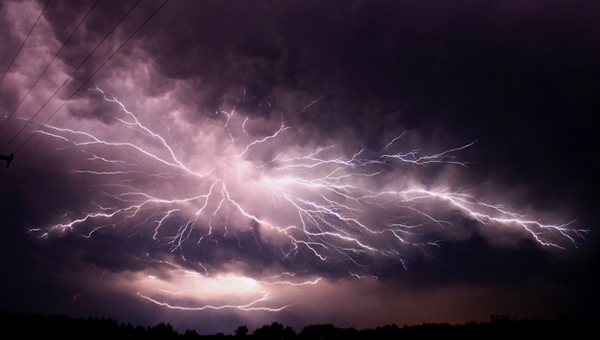 It is estimated that the earth is struck by 100 lightning bolts every second. As the differences in charges continue to increase, positive charges rise up taller objects such as trees, houses and telephone poles. The charge can also move up you, causing your hair to stand on end! This is natures final way of warning you that lightning can strike near you very soon. If the negatively charged area at the bottom of the storm gets large enough, it sends out a channel toward the ground called a step leader. It is invisible to the human eye and moves in steps toward the ground. When the step leader nears the ground, or a target such as a radio tower, it repels all the negative charges in the surrounding area and attracts all the positive charge. As the positive charges collect in high enough concentration, they send out small bolts of ground to air lightning called streamers. If the streamers can make contact with the step leader, an electric current wave propagates up the channel as a bright pulse -- lightning! And of course, with lightning comes thunder. Lightning heats the surrounding air to as much as 50,000 degrees Fahrenheit, which is five times the temperature of the surface of the sun. 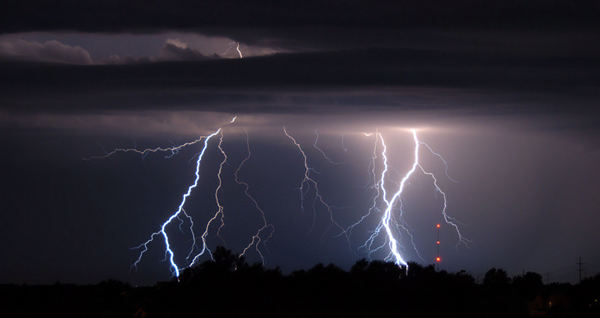 When air is heated, it expands, and this expansion is what's causing the sound of thunder. The expansion is happening faster than the speed of sound, which creates a sonic boom. Lightning usually claims only one or two victims at a time and usually does not cause the mass destruction left in the wake of tornadoes or hurricanes. Lightning generally receives less attention than any other weather hazard. Where organized sports activities are taking place, coaches, umpires, referees or camp counselors must protect the safety of the participants and spectators by stopping the activities so that participants and spectators can get to a safe place before the lightning threat becomes significant. If only isolated trees are nearby, crouch on the balls of your feet. A rule of thumb to follow is to stay twice as far away from a tree as it is tall. Don't lie on the ground. When lightning strikes a building, house or other structure, it follows metal conductors such as electrical wiring, plumbing and telephone lines from the structure to the ground. When this process occurs, it usually leaves the inhabitants unharmed. Once lightning enters the home it can surge through the electrical, phone, plumbing and radio/television reception systems. It can also travel through any metal wires or bars in concrete walls or flooring as well as windows and doors. It is important to avoid these conductors during an electrical storm. Basements should be used with caution during lightning storms (unless there's a tornado warning!) because they usually contain conductors. Avoid contact with washers and dryers since they not only have contacts with the plumbing and electrical systems, but also have an electrical path to the outside through the dryer vent. Concrete floors should also be avoided as they usually contain some form of reinforcement which can easily become electrified by a nearby lightning strike. Avoid bathing during a lightning storm as the household plumbing can carry a deadly current.